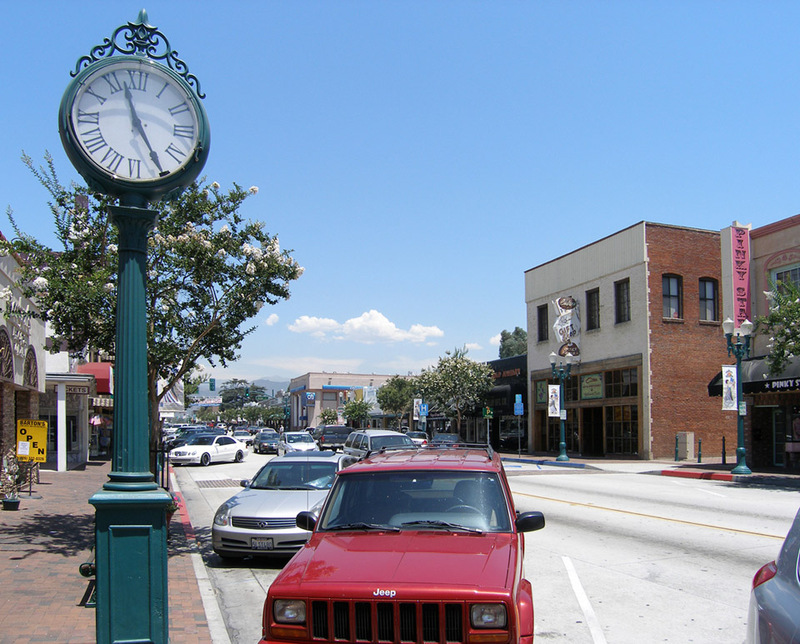 The big clock in downtown Covina is 100 years old this month! Here's its story from Donald Pfleuger's 1964 history of Covina. To the delight of all, the Finch Brothers Jewelry Store installed an enormous street clock in April, 1916. Weighing fifteen hundred pounds and bearing a double dial which could be read two blocks away in either direction, the enormous clock, lighted at night, became a city landmark for generations to come. It supposedly kept time without varying more than fifteen seconds in a month. Before the age of radio, people coming into town always set their watches by this famous timepiece. Although a source of civic pride for decades, the clock was in pretty bad shape by the '70s. For several years, it didn't run at all. I don't remember exactly when it was "restored," but I seem to recall it was in the early '80s while I was still living in Covina. Anyway, I was glad that they got it running again, but was disappointed that they replaced the original face and hands with ones that weren't authentic to its period. Looking at the clock today, it might come as a surprise to some that it is as old as it really is. The Finch clock in 2009. Does anyone have a photo of it back in the earlier 20th century? It would be especially cool to see a picture of the clock lighted up like Pflueger said it used to be!